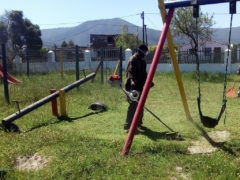 Tenikwa maintenance team got stuck in at the Kurland Edu-Centre in Kurland Village to clean up the playing area which was overgrown. 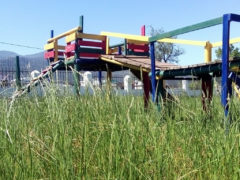 Now the children have a nice, newly mowed area to play outdoors in the great sunny weather we are experiencing in Plettenberg Bay this summer. Several individuals and organisations have got together to donate items for the Kurland Edu-Centre which is in desperate need of some pretty vital things like toilet paper, crayons, basic dried foodstuffs. Hanlie Alberts, one of our staff’s mum was so moved by the plight of the children that she went out and spent approximately R1500 on goodies for the children! Amongst her thoughtful gifts for the children were 4 x Story books, 1 x Punching bag and punching gloves, 1 x Set of hand coordination throwing hooks, 5 x Crayon sets, 2 x Kids Beach Tennis sets, 10 x Glues, 1 x Pinball set, 2 x Puzzles, 3 x Creative hand puppet toys, 3 x Masks, 5 x Hula Hoops, 1 x Car set, 1 x Toothpick pack, 1 x Earbud pack , 4 x Sticker sets, 6 x Bubbles, 1 x Straw pack, 1 x Wood glue, 6 x Watercolor – Paint. – Thank you so much, Hanlie. The following has been donated by Steven and Marycka Hendriks : 3 x Shoes, 3 x Socks, 1 x Newborn baby kit (dummies, thermometer), 1 x Summer girl clothing set (age 3 years), 4 x Summer Boys set of clothing (tops and pants) (age 4-6), 3 x Winter Boy set of clothing (age 3-4), 2 x Winter hats , 2 x Boys clothing sets with jerseys. (age 3-4years) , 1x Double sheet bedding. There are so many amazing kind-hearted people in Plett. 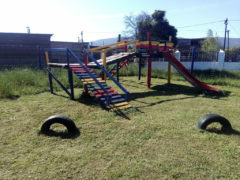 All the way from Switzerland, Corina Swan from Packed Again (www.packedagain.com) read about Kurland Edu-Centre on our website, and wanted her children to be part of the giving during her holiday. She collected together a whole lot of items prior to leaving, and we arranged a visit to the Edu-centre on 12/11/2018 when she visited us with her family. They handed out 28 x Smartie boxes, 2 x Suitcases full of clothes (about 100 pieces), 2 x boxes stationary, 10 packs x 2 min Noodles, 8 x Blankets, 48 x rolls Toilet paper, 6 x Hand soap to an excited group of children.